A lot has changed in the world of parachutes since Leonardo DaVinci sketched the first blueprints for the devices in 1485. Then the idea of falling from the sky was not even a thing. Of course, the idea of tandem skydiving out of a plane, which had centuries to go before it came along, was out of the realm of possibility. Today, many people like to do adventurous things. Millennials make up a big part of the adventurers around the world. It has been estimated that nearly 70% of them self-report as being adventurous. Following suit, many people every year take their first tandem jump. In 2017, there were 3.2 million skydives around the country, according to the United States Parachute Association (USPA). If you are a first time jumper and are looking to do a tandem parachute jump, there are things you can do to make the experience better and more fun. Here are some of them. Make your plans early. A number of skydiving centers book as many people as they can squeeze in. That can make it hard to get a spot on the day you want to go. That means there may be a large group of people waiting to do their tandem jump. You should call the center where you want to do your jump and ask about what their policy is and how far in advance you should book your dive. You should also see what the policy is if the weather is bad on the day of your jump. Ask if the reservation time is the time you should show up at the drop zone. For some companies, the reservation time is the time when you need to be at the site. For others, the reservation time is when you are going to actually do your jump. Getting to the site on time or early is a great way to start your experience off on the right foot. You should expect to be there between three and four hours. Ask your friends and family to come along. There are a few reasons this makes it more fun. First, the experience of having a cheering section support you is great. Also, a lot of people like to have their friends and family watch the jump. They also enjoy watching someone they know and love take the leap. Opt to get video or photos taken of your dive. 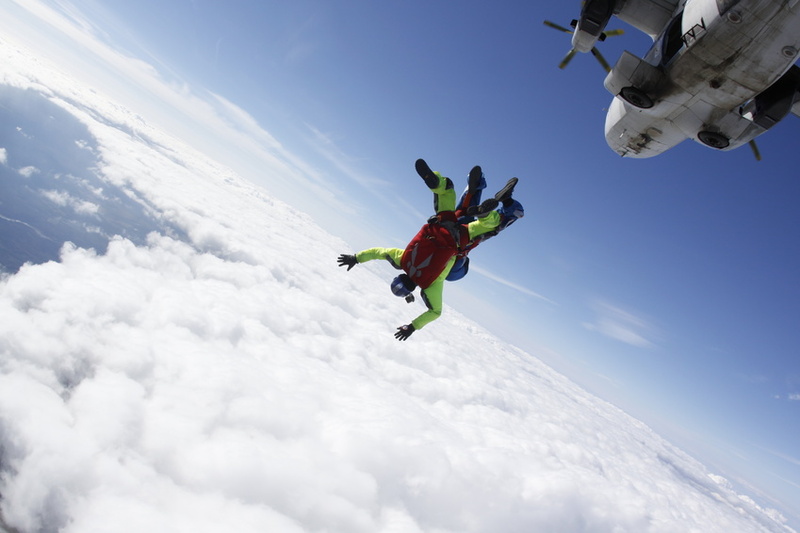 You only get to do your first skydive once, why not get a video or photographic evidence. The photos of you with your skydiving gear on before, during, and after the jump will make great posts for all of your social media channels. A video of your experience makes for great YouTube fodder. And when you get this, you have evidence of your jump and something to show your friends and family who were not there to witness your adventurousness first hand. Watch what you eat and drink before your jump. The day of your jump, you should just eat what you normally eat. This is not the best time to start a fast or overindulge, just eat the way you eat every other day. You should also get enough water or other non-alcoholic beverages on the day you take your jump. You do not want to be dehydrated, it can really be detrimental to the experience and how you feel when you jump. The night before you jump, you should not go out and drink a lot of alcohol. A hangover is not the best feeling and can make you sick during your jump. Have fun with it. Skydiving is not like other experiences you have. Fill your head with positive thoughts and you will have a better experience during your jump. Typically, the free fall lasts between 45 seconds and a minute and the glide to the ground four to five minutes after that. There are a number of reasons people like to go skydiving. Some like the adrenaline rush they get when they jump. Some people are afraid of heights and want to get over that phobia. Whatever your reasons for taking your first dive or your fiftieth, these six tips can make the experience better.